What is a Carbon Dioxide Extinguisher? 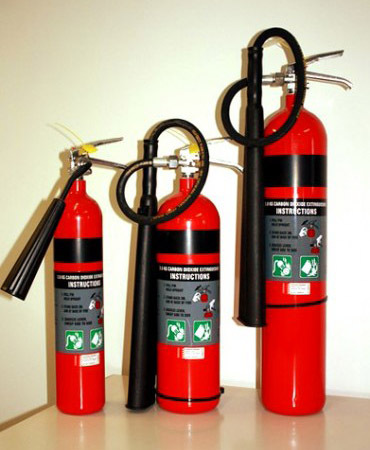 CO2 Extinguishers can be identified by its color labeling…which is red with black band. Carbon Dioxide is discharged as white cloud of ‘snow’ which smothers a fire by eliminating oxygen. For use against electrically energized equipment and in electrical environments (Class E). Extracted from the atmosphere, CO2 is stored in a liquid state and at high pressure. The effect of a CO2 extinguisher can be limited where there is air movement and discharge within a confined space is definitely NOT recommended. Suitable for Class E fires. Has limited effectiveness on Class A, Class B and Class F fires. Available in 2.0 Kg, 3.5 Kg, 5.0 Kg sizes. WHY BUY YOUR CARBON DIOXIDE FIRE EXTINGUISHER FROM LONDON FIRE & SAFE?